The Sikh Gurdwara San Jose was founded in the Early Eighties by former President late Jit Singh Bainiwal, Teja Singh, and late Baba Pyara Singh Obhi. Late Jit Singh Bainiwal, Teja Singh, and late Pyara Singh Obhi along with the other dedicated sevadars from the community founded the Sikh Gurdwara San Jose in 1984. The South Bay Sikh Community was growing rapidly and there was an urgent need for a local Gurdwara for the congregation to attend. Initially the Gurdwara held smagamâ€™s at a local community center. In 1986 after enormous obstacles the Gurdwara Committee purchased a small building on White Road. Within a few months the Gurdwara Committee realized that the building was too small for Sangat. In 1990 the Gurdwara Committee purchased a parcel of land at 2785 Quimby Road, and then bought other two adjacent parcels over the next few years, which brought the total land owned by Gurdwara to about 5 acres. In 1993-94 the Gurdwara Committee under the leadership of Jit Singh Bainiwal and Bhuphindar (BOB) Singh Dhillon along with other committee members determined that it would not be efficient due to the future growth of the Sadh Sangat. Keeping things in perspective the residentâ€™s surroundings and the future needs of a larger Divan Hall and parking for the sadh Sangat was a must. There were also City and County requirements that would not have met the needs of the Gurdwara. Mr. Bhuphindar Singh Dhillonâ€™s vision came a reality after looking at many properties Bob Dhillon the current General Secretary found our current home which is located at 3636 Gurdwara Avenue. The property is located in the Evergreen Hills of San Jose, California. This property sits on forty acres and has beautiful views of the bay and city lights at night. 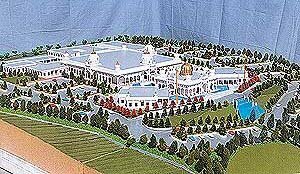 This will be the largest Gurdwara in North America. The First phase was completed in 2004 with the entire infrastructure for 12 Million Dollars. The Second Phase is now completed with cost of 20 Million Dollars. Bhupinder Singh Dhillon along with the current committee member are thankful for all of the support of the Sadh Sangat to make this the most beautiful Gurdwara in the world. Copyright Â© 2000-2011 Sikh Gurdwara San Jose, CA. All Rights Reserved.